The ongoing exhibition “@Large: Ai Weiwei at Alcatraz” is both revelatory and heart-wrenching, a stunning and sobering work by an artist who understands firsthand the fragility and pricelessness of freedom. Detained without warning or charge for 81 days in 2011, Ai Weiwei now lives and works in a courtyard house with a teal blue gate in the Caochangdi arts district of Beijing. Across the street is a surveillance camera from which Ai has hung a cheery red lantern; outside the gate is a Giant brand bicycle with a metal basket that Ai fills with fresh flowers each morning¬—a practice he plans to maintain until the Chinese government returns his passport and the right to travel internationally, denied him since his detention. Within the spacious courtyard, plump tabby cats wander through stands of gently swaying bamboo and an international staff of assistants shepherd visitors and oversee the execution of Ai’s many ongoing projects. As my husband and I sat down to chat with Ai one day this summer, the fattest cat leapt onto my lap, curled up, and began to purr. Indeed, even as Ai now leads what he calls “a peaceful life,” “@Large” demonstrates that he has not forgotten those whose lives remain desperate, among them prisoners of conscience worldwide. Viewed collectively the seven installations that comprise the exhibition, curated by Cheryl Haines and presented by the For-Site Foundation, celebrate freedom, mourn its loss, demand its recognition as a basic human right, and honor those who have lost it because of ideas or affiliations. And the exhibit does so all from within the forbidding confines of the infamous former federal penitentiary that stands atop a windswept island in the middle of San Francisco Bay. Although Alcatraz is visited each year by huge colonies of seabirds, 1.3 million tourists and, I suspect, the occasional fright of lingering ghosts, Ai Weiwei has never set foot there, viewing it remotely over Skype and collaborating online—a fact that makes the successful, site-specific installation all the more remarkable. “@Large” begins in the bleakly beautiful New Industries Building, where prisoners once followed Alcatraz Regulation 21: “You are required to work at whatever you are told to do.” Often, this was sewing prison uniforms in the vast, sunlit room with its tantalizing view of the Golden Gate Bridge. It is here, in the first of two halls, that Ai has stationed “With Wind,” a giant dragon constructed of hand-made kites emblazoned with quotes from people imprisoned or exiled for exercising what many deem basic freedoms, among them Nelson Mandela and Edward Snowden. Ai selected these individuals based on information provided by Amnesty International and other human rights organizations, as well as independent research by the artist’s studio and the For-Site Foundation. Beyond the dragon, in an even vaster concrete space, is “Trace,” perhaps the centerpiece of the show. It consists of 176 portraits of prisoners of conscience; Ai calls them “heroes of our time.” Each image is constructed from colorful LEGO bricks—1.2 million, in all—and spread out on the worn, whitewashed floor. Viewers are able to walk freely around the portraits and then consult large books in which each prisoner is listed with a brief description of the circumstances of his or her detention. (The For-Site Foundation’s excellent website also documents the exhibition.) The bright colors and happy associations of the LEGO pieces at first seem to clash with the plight of the men and women depicted, not to mention with the peeling pillars, rusted ceiling pipes, shattered glass windows, and overhead “gun gallery,” from which armed guards once kept watch over prison laborers. But, ultimately, the quixotic material serves to emphasize the individual life force of each of the men and women portrayed who sacrificed everything for their beliefs, emphasizing the interconnectedness of us all. Indeed, even as “Trace” elicited my compassion for these prisoners of conscience, it also forced me to question the extent of my own complicity. We all write postcards for Amnesty International when we are in high school, but how many of us ever do anything else? Greetings from San Francisco. Librarians are civilizations’ memory keepers. Keep your own spirit strong. I never expected I would become like today, which is beyond my control. I have only been an artist for 10 years—2004 was my first show. Before that I was doing architecture and curating shows. In 2005, I opened my blog. People said, you could say so many things needed by society. I had never touched a computer before—I asked my assistants to help me learn to do it. But I realized social media was such a great thing—only because I am in China where there is no forum to put your ideas. I enjoyed the daily chats and I became very popular. It was like a bird who feels it has more feathers. Then, he explained, the devastating Sichuan earthquake occurred and he began to document the deaths of children who died in poorly-built schoolhouses that crushed them at their desks, visiting hundreds of students’ homes and posting the names of more than 5,000 young victims on the Internet. I tried to show people you cannot just sit there and criticize, you have to do something. But there was a limit to their tolerance—they shut down my blog. Since 2009, I could not post online in China. So I became dangerous to society but very popular with young people. After 2009, he said, there were “too many stories.” He was beaten and hospitalized; his Shanghai studio was torn down; he was detained, released, and then accused of tax evasion. For years he has been closely watched and his movements restricted, to varying degrees. Ai Qing in Paris, 1929. Ai senior was born in 1910 to parents who ordered him not to call them mother and father because a fortune-teller had said he would bring trouble. “It was as if I had no parents,” Ai Qing later wrote in the preface to a bilingual edition of his poetry. “This made me detest fortune-telling and superstitions in general, and confirmed me as an atheist as well. In my early youth, I sought consolation in painting.” His head “filled with Romanticism,” Ai Qing went to study art in France but returned to China after the Japanese invasion so he could work with the League of Left-Wing Writers. In 1932, just months after his return, he was arrested by secret agents in Shanghai’s French concession, charged with “subverting the government,” and jailed for three years. Ai Qing’s first volume of poetry, titled “Dayanhe,” after the peasant wet-nurse who he seems to have loved like a mother, was published in 1936. 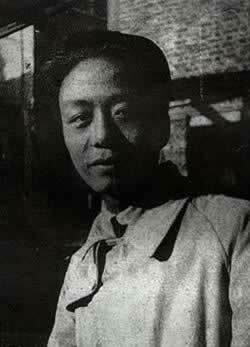 In 1941, with the help of Premier Zhou Enlai, Ai Qing went to the Communist base camp of Yan’an where he sometimes discussed literary policy with Mao Zedong (who he subsequently described as “the most impressive person I’ve ever encountered in my life”). The two men, warrior and poet, met several times in the spring of 1942 to talk about the intersection of art, literature, and politics. Mao asked Ai what he ought to do about certain problems in the literary world, and this was Ai’s reply, published in the preface to his selected works, was: “I said, in all innocence, ‘Call a meeting. You can explain things then.’ He said, ‘Will anyone listen to what I have to say?’ I answered, ‘At least I will be there.’” Mao then called the Yanan Forum on Arts and Literature in which he made a seminal speech regarding the relationship between art and politics that still echoes in China today. A detail view of artist Ai Weiwei’s “Blossom” installation at the “@Large: Ai Weiwei on Alcatraz” in San Francisco, California. 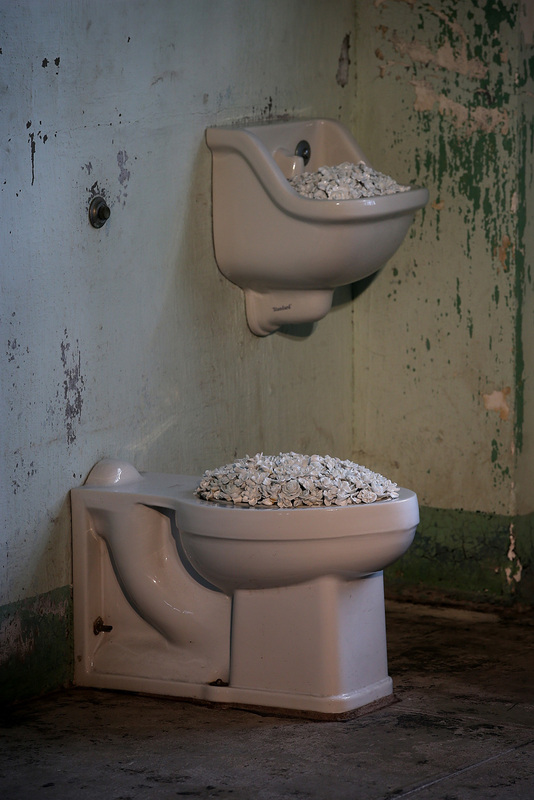 The exhibit features a series of seven site-specific installations by Ai in four locations on Alcatraz Island. The exhibition explores human rights and freedom of expression through large-scale sculpture, sound, and mixed-media works. The show runs through April 2015. That could unlock that kind of prison gate. Am a descendant of peasants. Of people living on the plains. No, I am not happier than you. Ai Qing’s passionate patriotism served him well in poetry but not in politics. Although he was appointed Deputy Editor of the prestigious official literary magazine People’s Literature, in 1949, by 1957 he had been labeled a rightist and exiled, first to a labor camp in Heilongjiang and then to remote Xinjiang. Ai Weiwei grew up in Shihezi, Xinjiang, and in his youth read the works of Whitman, Mayakovsky, and Neruda, poets greatly admired by his father. “When I first went to America,” Ai Weiwei remembered with a laugh, “in my mind it was like Whitman and Twain—and then I found myself in New York!” However the two men, father and son, “didn’t have much communication,” according to Ai Weiwei, who says he has only read some of his father’s poems. (According to his obituary in The Independent, Ai Qing wrote “over 20 lyrical and narrative poems as well as 1,000 short poems and nearly 200 essays.”) In his son’s recollection, Ai Qing was “critical” of him as a child, and for years Ai Weiwei did not consider his father to be much of an influence. Ai Weiwei left New York to return to China in 1993 because his father was ill. Ai Qing died three years later. So you took me and put me in jail. As if slitting a chicken you slit my throat. While Ai Qing spoke out with verse, his son speaks out on Twitter, creates images with LEGO, and makes music and song for performance on YouTube. Though their media are different, the message is fundamentally the same, as are the integrity, determination, and fearlessness required to continually speak out in a nation, and a world, where one can be jailed for nothing more than having a contrarian opinion. Any artist who isn’t an activist is a dead artist. I try to make my works honestly with respect to my life, to reflect the place and time in which I live. I hope that when future generations see my work they will understand my struggle as an artist. I also hope that visitors to @Large will be conscious of artists’ efforts to protect freedom of speech and expression, and that they gain an understanding of the purpose of art, which is the fight for freedom.